No 209 Cabernet Sauvignon Barrel Reserve Gin (92 Proof) was created out of a nod to No 209's wine making history. The spirit was an experiment, run in 2013. It went swimmingly and was released to the pubic in September of 2015, from the Rudd Oakville Estate. 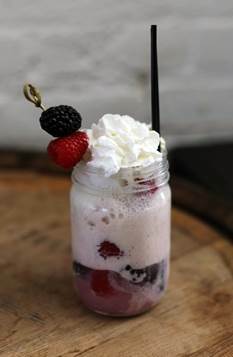 Method: Place half amount of berries in mason jar or glass, with gin and simply syrup. Lightly middle, and add one scoop of ice cream. Add more berries, ice cream, and top with soda and whipped cream. Garnish with remainder of berries. Method: Add gin and simple syrup to mason jar and mix. Add one scoop of ice cream and whipped cream and fresh cherry to garnish. 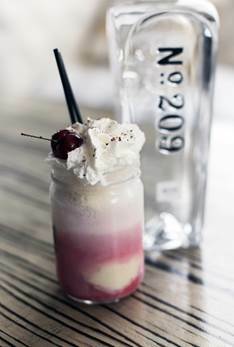 *Cherry Gin: Combine one cup of pitted Bing cherries and one liter of No 209 Gin. Muddle cherries lightly. Refrigerate for 24 hours, and strain out cherries. In lieu of infusing, muddle several cherries with gin and strain out. Method: Pour infused gin into mason jar and add one scoop vanilla ice cream. Drizzle on 1 oz. of chocolate syrup on the ice cream. Add second scoop ice cream. Add second oz. chocolate syrup. Top with whipped cream and garnish with banana chips and shaved or syrup chocolate. *Banana Chip Gin: Combine one cup of dried banana chips and one liter of No 209 Gin. Muddle bananas lightly after 2-3 hours. Refrigerate for 24 hours and strain out bananas. In lieu of infusing, muddle several banana chips with gin and strain out. Method: Drop one scoop of ice cream into mason jar or glass. In a separate vessel, combine gin and raspberry syrup. Pour ½ of the gin/raspberry combination over the ice cream. Add one more scoop and repeat process. 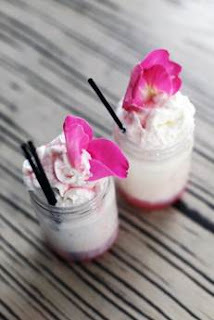 Top with whipped cream and garnish with rose petals. *Raspberry Syrup: Combine one quart boiling water with one ¾ quart white sugar, until sugar is dissolved. Place in blender, and add one pint fresh raspberries. Blend, and fine strain. To get your No 209 Gin, you may search online from the 209 website. 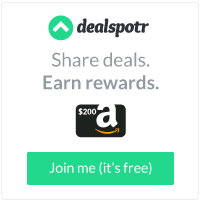 We also found it here for $46.99. Other sites were more expensive or had some weird steps to go through, to buy. Remember, gentle readers, it's never too late to be patriotic!